Blueberry Bulk Seeds: The Best of Northern Lights and Blueberry For an Incredible Indica. One could speculate that taking two excellent strains, like the famed Northern Lights and the equally popular Blueberry, would result in an all-around superb creation and those who think so would be absolutely right. With Zambeza’s Blueberry Bulk Seeds, cannabis enthusiasts can now enjoy the best of two truly spectacular strains! 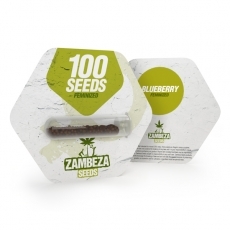 Blueberry Bulk Seeds by Zambeza display the same qualities that cannabis growers love when they grow Northern Lights. The plant will reach a convenient 60-90cm when grown indoors which makes her a good choice if your growing space is somewhat limited. Although not a tall plant, she makes up for it with compact and bushy growth where she shines with decent yields of up to 400g/m² indoors, thanks to her productive Northern Lights parent. When you grow her outdoors in ideal conditions you can really max out Blueberry’s yields. Outdoors she can get up to 230cm tall and can then reward the grower with up to 500g of some fine premium bud per plant. Her flowering time is a rather short 60 days, yet another plus for anyone who grows the Blueberry. While growing Blueberry Bulk Seeds doesn’t require rocket science so that basically anyone can look forward to some good results, smoking her won’t leave a doubt that we’re dealing with a first-class indica that has award-winning parents. With THC levels measured a high 19%, she’ll deliver a powerful, heavy-hitting physical indica stone and nice body buzz that’s incredibly relaxing as soon as you take a hit, making for a fantastic smoke if you want to chill at the end of a day, for watching movies or if you want to get rid of stress. This great smoking experience is only enhanced by her awesome aroma that blends fresh and sweet notes with the famed berry flavour of her Blueberry parent. Blueberry Bulk Seeds by Zambeza combines two of the best strains to give us an indica with all the qualities that cannabis enthusiasts love about Northern Lights and Blueberry. This indica is easy to grow, tastes awesome and delights with an excellent high, making for an all-around fantastic strain and “must grow” for any indica lover! Blueberry bulk seeds are available in packs of 100 seeds each.